Yeah, but Manny, we want Bob Redford for all three leading men. O.K., Jimmy Caan for Weiskopf, but Redford's got to play those two blond guys, Nicklaus and Miller. We call it The Greatest Golf Tournament Ever Played. So people argue. Who'll know? One blond guy makes a putt from here to Encino, and then the other two guys miss putts on the 18th from so close the hole looks as big as Coldwater Canyon. 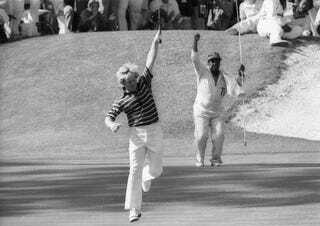 Now the blond guy who wins, Nicklaus, who is already the best there ever was, he marries his one-iron and takes his putter for a mistress. Cut and print.Ciao, baby. There was something about the 1975 Masters that was cinematic from the beginning. The setup was perfect, all of the world's best golfers coming into the thing primed, poised, inspired, eager. And sure enough, it began to unfold toward what promised to be a historic climax, one way or another. But no one could possibly have imagined that in the final hours, it would become so excruciatingly exciting and monumentally meaningful in terms of the characters involved. Honestly, if someone had said to one of those brilliant screenwriters, Do me a script where the year's first major tournament comes along, and on the last day, Sunday, April 13, Jack Nicklaus and Johnny Miller and Tom Weiskopf go out there and undergo the most unbearable of sporting pressure and provide the most inconceivable of thrills, hole after hole, until the whole business is ultimately decided by the vagaries of the game itself, what would have been written was precisely what happened last week in Augusta, Ga.